Looking for top quality hospitality staff? Learn how Platinum Recruitment can help you find professional candidates today! Platinum Recruitment is a leading hospitality and catering recruitment agency specialising in recruitment for hotels, restaurants and event catering companies. We have dedication divisions to source staff across Winchester, Southampton and Portsmouth. If you’re looking to fill chef roles in Winchester, we can provide the ideal catering recruitment solution for your company. Platinum Recruitment works closely with some of the most renowned independent pubs, restaurants and Michelin star restaurants in the UK. We provide only high-standard candidates for all catering services, from waitress jobs to restaurant managerial roles. Platinum Recruitment provides top quality professionals for a range of accommodation services, such as independent boutiques, and large international hotel chains. We are committed to providing a tailored hotel recruitment service to find the ideal candidate to match your needs. 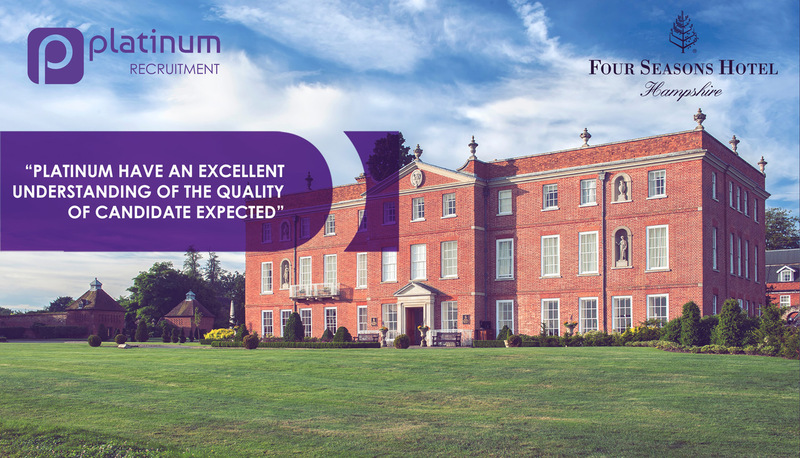 “Platinum have an excellent understanding of the quality of candidate expected by Four Seasons Hotels. Not only do they deliver on brief, but they ensure you receive frequent updates and can assist at short notice.